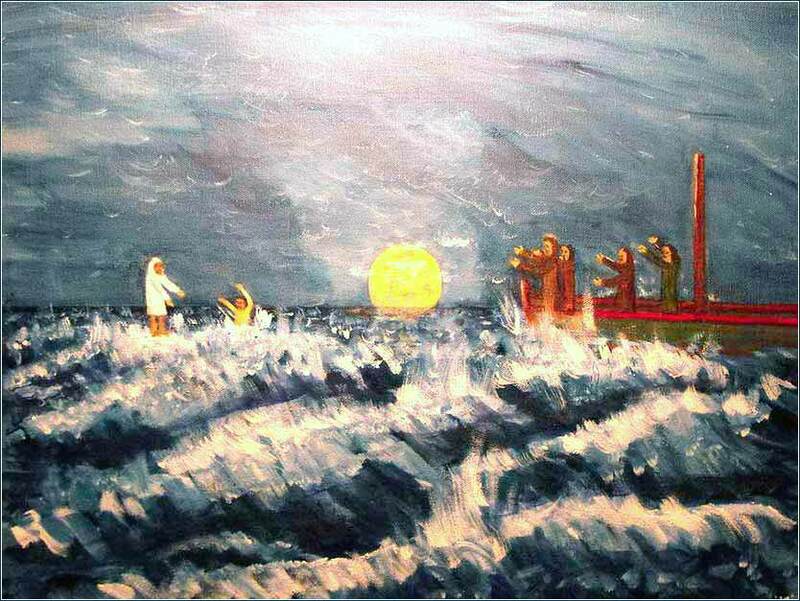 Jesus and Apostle Peter Walk on Water by Larry Farris, contemporary, self-taught artist in Baton Rouge. 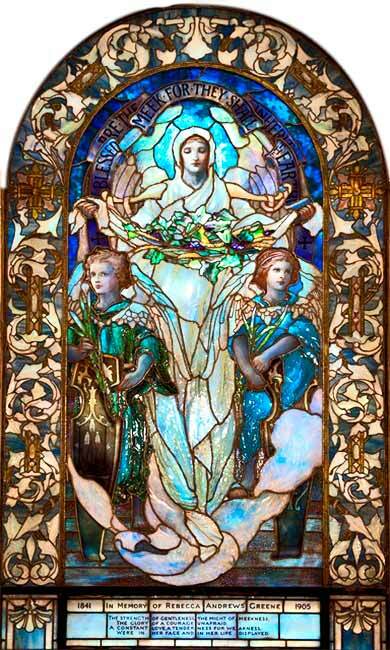 Blessed Are the Meek, Tiffany Studios for Arlington St. Church, Boston, ca. 1919. Directly after this Jesus insisted on his disciples’ getting aboard their boat and going on ahead to the other side, while he himself sent the crowds home. And when he had sent them away he went up the hill-side quite alone, to pray. “Come on, then,” replied Jesus. Why did Jesus command his disciples to depart and then isolate himself, away from his followers? In modern terms, “he had the crowd”. If He wanted to spread the Gospel, this would seem the opportune moment to consolidate his organization. There is one reason we know and another we might infer. The known reason is given to us in John 6:15 “Then Jesus, realizing that they were going to carry him off and make him their king, retired once more to the hill-side quite alone.” The crowd, expecting a Messiah who would sit on throne of David, had become a mob and would have tried to force Christ into politics, the exact opposite of God's plan. The second, inferential reason is related, for we see throughout all four gospels that Christ introduces himself as the Son of God gradually. God plans that Jesus will build a foundation of knowledge and introduce his teaching to the world one step at a time, at a pace at which it can be accepted and understood correctly. Even in the three years He took to make himself fully known, his closest disciple, Peter, would not be able to grasp Christ's meaning until after the Resurrection. Even today, Christianity is hard to understand; not because it is intellectually complex, but because it is contrary to people's preconceptions. Change is difficult; and Christianity, being a radical change from every human being's natural core beliefs, is radically difficult to grasp. Jesus walking on water has to be high on the list of his best-known acts, so here is a big surprise: It might not have happened. The Greek original of Matthew's text can just as correctly be translated to say that Jesus walked to the edge of the water and called to his disciples from shore! The Greek is ambiguous. But like the translation of John 3:16, the interpretation that He walked out onto the water has become so ingrained in Christian tradition that no Bible would dare say otherwise. And, in fairness, the “walked on water” translation is perfectly justified and the context would seem to support it. So, does it make a difference to you one way or the other? The really important lessons to the story are not Jesus performing a magic trick, but rather, first, his leaving his prayers to come to the aid of his disciples. He will come to us in our time of need. It is harder to grasp that the God of billions of galaxies, each with billions of planets, at least one of which has billions of inhabitants, would deign to come to the assistance of one little person: but Jesus, time and again, shows us that He will. Secondly, He calms their fears. One of the benefits of Christian belief is that, the deeper your faith, the less fear you live with. Even when Peter loses faith, Jesus reaches out and takes his hand. We remember when He reached out his hand to touch the leper. These events inform the old hymn, Precious Lord, Take My Hand. When we sink into fear or despair, Jesus will wield the mighty power of God to take us by the hand. And He takes Peter's hand, even in a moment of loss of faith. It is the primary message of Christianity: Jesus will reach out to us personally and save us from our sin.